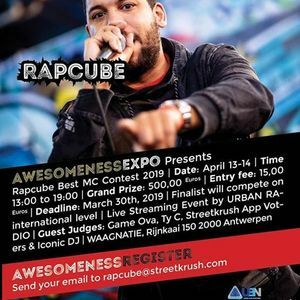 International Rap Showcase Contests - Grand Prize €500.00 Euros!! Antwerp, Belgium Saturday 13 & 14 April 2019. Live performance by Bizarre Ride II the Pharcyde (founders of the Pharcyde) performing classics "Passin' Me By" & "Runnin' " & "Animal". The Street Krush Urban Expo brings together culminations of street culture: Rap & Hip Hop, Urban Dance, Graffiti, Street Fashion, Sneaker Culture, Car Tuning, Tattoo Art, BMX, Skateboarding, In-line Skating and E Gaming. - Open Mic / Live Cypher - Hosted by Freestyle Champion Dmeezy. 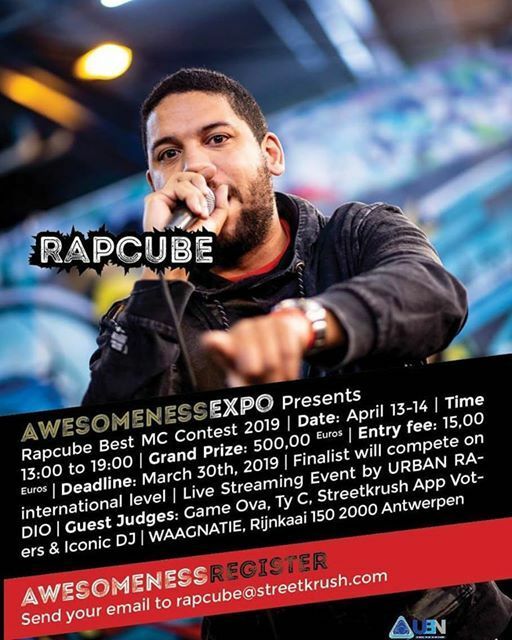 - Freestyle Battle - w/ DJ Dysfunkshunal, Fatty K & Ty C.
- Live streamed radio show, performances & interviews. - Hosted by Freestyle Champion Dmeezy.